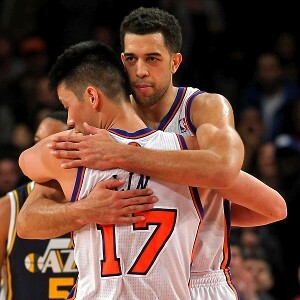 Agree with @FisolaNYDN and absolutely do not rule out Knicks matching Landry Fields offer sheet. They have a 3-year window to win now. This is something I have not thought about, with the Knicks a tad thin at the SF/SG position. They would be able to match Fields offer from Toronto and bring him back, they would take a large hit in luxury tax, but who pays the luxury tax? Oh yea that’s right Dolan does, but who really pays the luxury tax? We do, cause we should expect a nice boost in ticket prices AGAIN! With the MSG remodel and the sky high luxury tax penalty, Knicks tickets will NOT be cheap. Jeremy Lin might urge the Knicks to sign Fields and keep he and his #bff on the same team for at least 3 more years, and when looking at this roster. The Knicks are primed for a run these next 3 years with Melo, Amare, Chandler, Camby, Kidd and Lin (if they match the offer from Houston). The only Knick signed beyond the 3rd year is Novak, so maybe this is the way we go, spend all the money on consistency and chemistry? Jerry Colangelo says the #Knicks are currently "50-50" on matching Landry Fields' offer-sheet, according to @MichaelGrange.